Children in the U.S. won’t be unwrapping these dolls on Christmas morning. More than 200,000 dolls – imported from China to the U.S. – have been seized by authorities as they were alleged to contain the banned chemical compound phthalates. Phthalates are a chemical compound that makes some plastic more flexible and pliable – it also helps to hold a perfumed scent. Goods containing high levels of phthalates have been banned in the U.S. (they are also banned in Australia). These seized toys contained high levels of the chemical agent, which threatened the safety of children. U.S. authorities tracked ten shipments, valued at almost USD500,000, and seized them at the ports of Chicago, Dallas, Los Angeles, Norfolk Virginia, Memphis Tennessee, Newark New Jersey and Portland Oregon. 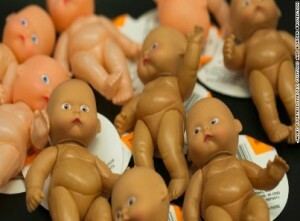 The U.S. toy industry has praised the seizure of the dangerous Chinese-made merchandise. Let’s hope that Santa puts something less dangerous in the stockings of American children!